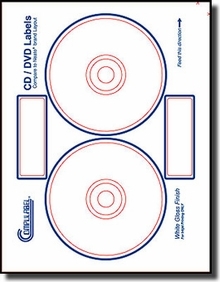 Neato® Format Photo Quality Glossy CD DVD Labels which can be printed on Inkjet Printers (only)! 20 Sheets-- 40 CD, DVD Labels in the Neato Format. This is a New Layout, that has the small circular cutouts in the center, allowing you to cover more of the CD, or not--Your Choice! These are TOP QUALITY Labels, fully guaranteed to meet your satisfaction. Neato and MediaFace are registered trademarks of Neato, Inc. 100% Satisfaction Guaranteed! Genuine Compulabel® Brand Labels repackaged by Label Outfitters! into Smaller Packages for Your Convenience!